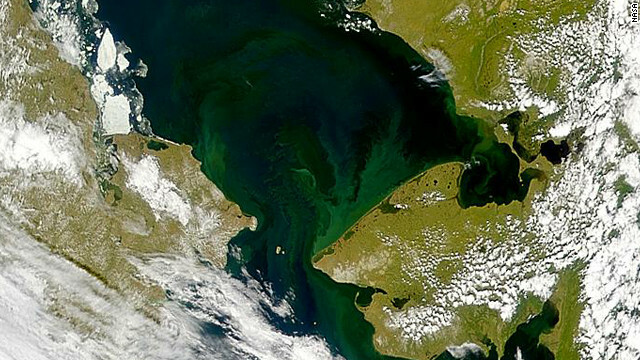 A satellite image of the Chukchi Sea, between Alaska and Russia, shows phytoplankton bloom (in green). Scientists in the Arctic have discovered the largest ever under-ice bloom of phytoplankton, likening the discovery to "finding the Amazon rainforest in the middle of the Mojave Desert." Researchers were amazed to discover a colossal 100 kilometer (62 miles) stretch of phytoplankton blooming under Arctic ice, north of Alaska, in July last year. It had previously been assumed that sea ice blocked the sunlight necessary for the growth of marine plants. But four times more phytoplankton was found under the ice than in ice-free waters nearby.